Win a signed print from Pam or Mystele...we will each randomly draw one name from the comments. From Pam you can win Java Joy, which was painted with COFFEE. No paint used! I see that you like to be up late as well! Thanks for stopping by! I really like the Java Joy piece! Make sure you get your second entry in! ;) Love and miss you guys lots! Wonderful giveaway! please add my name to the hat! I'm totally intrigued by the Java Joy. This must have taken forever to get the shading right. beautiful give away, please count me in! How fun! I love both prints!!! What beautiful prints! Just lovely. How creative to paint with COFFEE! the mind boggles, it is so cool! Oh yea! Please add my name, and thank you for offering these lovely prints! Myste, your painting is wonderful! Please enter my name to your drawing! Visit my blog http://miawoo.blogspot.com/ as I'm also OWOH participant! These are wonderful! I love the little houses! Oh they both are great!! Love the coffee though!! hop on over to my blog for my giveaways!! Beautiful ART and I'd love to be considered for your OWOH giveaways. Wonderful giveaway..please count me in and thanks so much! Both are gorgeous! Please enter me. Coffee creative...I love it, please enter me! Beautiful! please count me in and do come on over to visit my giveaway. Two possibilities! Great giveaway! I would love to be the winner! Please enter me! Thanks so much! And be sure to come enter my OWOH giveaway too! Wonderful art! I'd love to enter and you can enter on my blog as well. Love these pieces. Please include me. Drop by mine, too! Great pieces, love seeing everyone's art. Please enter me for your drawing. Wonderful! Would love to be included! I can not paint to save my soul and would love to own one of these! Thanks for the chance to do so! how delightful...please count me in! What a wonderful blog! Please sign me up for your marvelous drawing and then come visit me...I am participating in OWOH too! I am off to read more on your blog and I am looking forward to it! Both Are FUN FUN FUN! WOW! 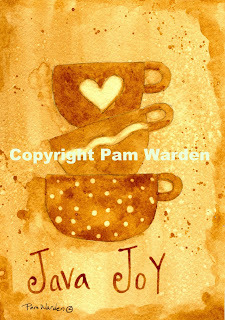 I love the fact that "Java Joy" was painted with coffee! I don't drink coffee but I love the smell and I am a coffee dying maniac. My husband gets on to me for using all the coffee and not drinking any, LOL. The other piece is gorgeous, I love all the colors and textures. Very nice! Please enter me in your drawing. Thank you for the opportunity to win one of these marvelous pieces. Both are so unique and divine! I've never tried painting with coffee before. I would love to be the lucky winner of either of these lovely little works of art. Please include me in the draw. I am stopover #70 on the Magic Carpet Ride. Please come by and visit me too......enjoy the ride....and happy landings. Please enter me in your wonderful giveaway and visit my blog to see mine. P.S. I'll be out of the country and away from the internet from the 14th-20th, so if I'm luck enough to win, PLEASE don't give my prize away! PRETTY PLEASE....LOL! Very nice blog and gift. Please visit my blog as well. Your work is simply breathtaking--just beautiful! Thank you for this generous giveaway! I'd love to win any of these lovelies!! I would be honored to have a signed print. Thanks for offering this great giva-away!Please count me in? Painted with coffee? Very clever! What a lovely idea. I'd love to enter please. If you would like to enter mine I'm number 270 on the list. Love the prints and hope one will be mine. Please visit my blog too. Oh oh oh oh I love this please add me to your list! Beautiful!! Pop by mine and add your name to my hat too!! I would love to have an opportunity to win your giveaway. Love your giveaway! Hope I'm the lucky winner. If you are traveling the 'Magic Carpet Ride', I'm #395. Gorgeous work! Please count me in your giveaway. Coffee is my drug. What a great idea painting with it. What wonderful giveaways!! I love them both! Thank you for entering me in your giveaway. Please stop by my blog and have a chance at my giveaway too!! As a coffee drinker, I LOVE the coffee art! The journal page is so vibrant, I imagine framing it and putting it in my craft nook for inspiration! Thanks so much! I do hope you'll be able to drop by my blog:http://kidney-garden.blogspot.com/ where I"m giving away paper banners/bunting. Oh I especially love the second one with the houses. Thank you, both of you. What a great giveaway! Nice to meet you. Don’t forget to come visit me too. I’m #391 on OWOH. Well done art! I like it. Wow, awesome paintings! Can't believe you can do that with coffee! Beautiful art! I love coffee paintings! I would love a chance to win this. I think I'm going to be quite busy visiting all these blogs! I am also participating! FABULOUS pieces!! LOVE Please enter my name in your drawing :) What a FUN event...enjoy the ride!! Made with coffee...no way. Sign me up. Greetings from Maine, please stop by #499 to see what I have to give. Either one of these beautiful pieces of art would be a joy to own, please sign me up. your blog has made me a follower :)I adore coffee too! Hope I win! I'd love to be included in your drawing! I'd love to win. Add my name to the hat! Thank you both for this generous giveaway! I would love to win. Lovely blog,and awesome prints, please count me in! Good Luck and Godspeed to all your visitors! Oh my gosh, what beautiful prints!!! I would love to be entered into your drawing. I really love your work.......please enter me in. Two beautiful paintings, thanks so much for the chance to win. Hope you find time to stop by my blog and look at my giveaways too. Amazing art work! Thanks for the chance to win this fab giveaway. Both prints are wonderful... thank you for offering them up for this event, Pam & Mystele! I'd love it if you'd put my name in your drawing. Thank you! & if you'd like...find your way to my OWOH giveaway to enter to win one of the two art-glass heart pendants that I'm offering. great giveaways! got to try the coffee "paint" some time! Beautiful art! Thank you! Please enter my name and visit me to enter, too! I'm #533 on the list! wonderful! Love them both, the journal page is great! whimsical journal page, you have inspired me! Love your giveaway! Hope I'm the lucky winner. cute prints! Please PICK ME to win in your giveaway drawing! thank you. Oh how cool you can paint with coffee. And the other one is so colorful and pretty as well. Lovely images! I love the fact that Java Joy was painted with coffe-such rich browns! These are just amazing. Thank you for the chance to enter your wonderful giveaway. how on earth do you paint with coffee!!!??? Does it fade? Do you use some sort of combining agent? I'm confused!! ha ha! Lovely gifts- thanks for participating so we can cruise around and find new blogs. Beautiful giveaways and beautiful blog. Thank you for the chance to win, please enter me. Beautiful! Count me in sisters! First congratulations! Second...coffee painting! Amazing! I love them both what great artistic talent. what a great giveaway, I'd love to win! Hi! It is so nice to meet you! I would love to be a winner. I just love the coffee painted piece!I have enjoyed visiting your blog and I will be back! How lovely. I would love to win, both would have a lovely place in my home! Both are so cool.. I love coffee so that works,,haah and the journal page is groovy! it never ceases to amaze me how people come up with such creative ideas!!! I wish I could do that...but I suppose I have other "gifts"..please include me....take care and God bless! Great art and love the new look. Come visit Thistle Cove Farm; I'm 211. Love it! I would love to display it. I love this contest, it is fun to discover so many wonderful blogs! Love them both. Please drop by my blog and enter my giveaway. Very Nice give awayl Love the coffee painting. how unique. The paintings are really nice. Thanks for a chance to win such beautiful art. Greetings from Coarsegold, CA...I love both of the gifts but the journal page really speaks to me...reminds me of the Storybook people but better. Please sign me on...enjoy the ride and come by for a chance to win my little spirit Figure. It's nice to meet you, I'd be glad you come visit me at my blog and participate in my own giveaway ! How very interesting to paint with coffee! I've never heard of painting with coffee, that is so cool! Oh my gosh! A painting from coffee? Wow. I haven't seen one of those yet. And the other - so colorful and fun! Hmmmm, interesting, does it smell like coffee?, or tastes it?, I'm just curious and obviously, I'd like to try by myself! How clever!!! and talented!!! And congrats on the calendar gig, too!! Both are beautiful prints. Love that the one is made from coffee, too cool! What beautiful creations! And the one is painted only with coffee??? Fun!! Please visit my blog for my giveaway (#526). cool artwork!! Love the idea of using coffee instead of paint! the houses are adorable too! Great artwork from both of you!!! Beautiful! Please enter me in your give away. Thanks! I love both giveaways! Thank you for the magic carpet ride and the chance to win. I'd love it if you came by to visit my OWOH #351 aka http://twinkietinydog.blogspot.com/2010/01/one-world-one-heart.html Who knows, you might like my giveaway too. would love to win your amazing art! glad to have found your blog! It would be a joy to win either one! Love the art! How beautiful and a double chance to win....please include my name. Whoohoo two winners, more chance to win! Wonderful, thanks so much! I'm your sis in the Lord too as I'm a Christian also! Oh please add me in the draw! I often wondered if I should or could paint with coffee, I have been known to dip my brush in my coffee once in a while! Gorgeous site! Lovely music and OH so love the art giveaway,,,I'd be honored to have either one!!! Stop by my little corner of the world and say hi and enter! Java Joy, I can certainly relate to that one! Love both prints. I'm giving away lace, a collage and a print! Oh I just found your blog and so glad I did. I love both of those folk art paintings. I'm amazed that the Java Joy painting is done with coffee instead of paint. Awesome! Very creative idea. Please enter me in the giveaway! Thank you. Are you having as much fun as I am riding the magice carpet? Love your giveaway, please enter my name and stop by mine when you get a chance - #234. I love your blog, the music and the wonderful art and giveaway. Please add my name to your draw. 2 great artworks! They're both beautiful in their own ways - whoever wins them will enjoy them for sure! Both prints are awesome, but I really like the Java one since I am a coffee fiend. I love that journal page, I sure would like a chance to win! They are both loely paintings and I would love to win either one. Found your blog via....I am not sure where I started actually! LOL! So encouraging to see artists honor Jesus! Love both!! Painted with coffee wow, it's good and the color in the other is fabulous. Please enter my name. I'm 274 if you get a chance to stop by. Oh heavens, to have won a giveaway from either of you beautiful ladies would be divine! I'm just lovin' the Magic Carpet ride this year...are you?